Bruising in the hoof wall is often unwittingly excused as self-inflicted injury. ‘Oh he must have stepped on a rock or something’ and ‘He was probably kicking the fence’. 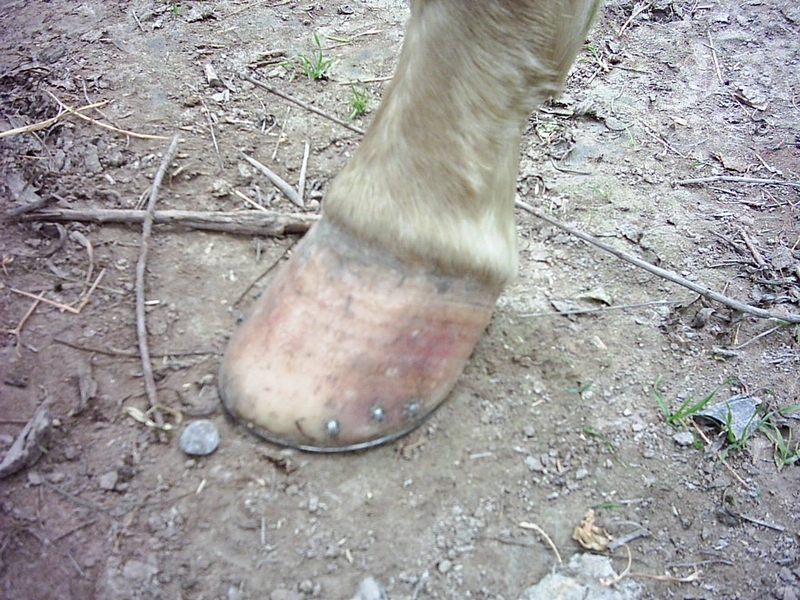 Yes these things do happen, but too often bruising is an indicator of hoof related problems leading to lameness. We are all aware of the pain when we bend a fingernail back, plus it creates a visible blood line in the nail bed. If it hasn’t happened to you, try pressing your fingernail hard against the edge of the table (Pic 1). The same results happen when the toe of the hoof is too long, or if the heels are allowed to flare. Bruising is not just in white hooved horses – the bruising is not visible in a black hoof (Pic 2) however you can rest assured it is there. Bruising is almost always associated with the presence of flares, which cause the hoof wall to bend outwards and become distorted; this in turn stretches the laminae/white line area and results in a bend in the wall about half way up, so now the blood vessels feeding the sensitive laminae begin to rupture and it is this we are seeing as blood colour or bruising on the outer hoof wall. Lameness occurs not so much because of this visual colour in the hoof wall but because of the flaring which caused it, so to correct this lameness we must first eliminate the flares. I know I sound like a record on replay sometimes, but we have to realize that the three main causes of lameness are: long toes/low heels, high heels/short toes, and the main one is the presence of flares anywhere in the hoof. I have so often heard the comment that it is impossible to get correct height clinches on these flared hooves as they’re always low (in fact you can even buy clinching tongs especially for low nails) but if we really look at these hooves we will see that the only problem is the flaring in the bottom of the hoof wall, and by controlling these flares we can now get correct height nail clinches as well as eliminating the lameness. So lets not ignore the visible bruises in those hoof wall – they are simply an indication that there is something going wrong with the current hoof maintenance (Pic 3). 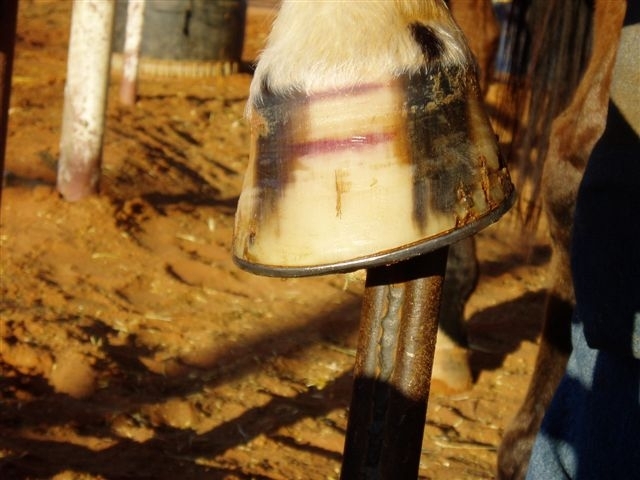 The true art of farriery is to provide preventative maintenance, and to do that we must see and understand what we are looking at in the hoof. The hoof is the blueprint to the behaviour and performance of the horse. Does this ring any bells? The horse with bruised hooves hates the farrier who generally only adds to its pain instead of resolving it. When I arrive for my consultation, the horse is being worked hard in the arena, complete with saddle and owner on its back. Then after it is washed down and is standing there exhausted and sad, I begin to explain to the owner about the flares and bruising present in all four hooves. It’s a really great horse as it turns out, it’s just in a lot of pain from poor hoof care, so then the horrified owner (in tears) gets defensive and blames the last farrier. She has a point but she and the farrier both have a duty of care to the horse to know what is correct, so lets get it right, for the sake of the horse.